Blog photography that I love always has a few things in common. Besides things like the image being clear and in focus etc, the first thing that I like to see is that the image looks like it was meant to be taken, I don’t like seeing a jumble of items on a countertop you know? It takes 2 extra minutes to arrange things to make it look like it has a purpose. I love really clean looking photos where there is a lot of white in the background, and an extra 10 points for having selective focus on the item(s) and the background being blurry. I love the look of really minimalist photos and also really cluttered photos when the “clutter” all makes sense together. All of these things are things I’m also working on but you know, when you see a great picture it really draws you into the rest of the post. In terms of what I look for in a photo, I’m a composition junkie. I’m still in the process of translating this obsession into my own photos, but I adore looking at other blogs that do it right. I have seen plenty of point-and-shoot photography that wowwed me with its artful arrangement (and some DSLR shots that were nothing spesh). A fancy camera can only get you so far, so whatever you are using, get as creative as possible, arrange and re-arrange to your heart’s content and you can’t really go too far wrong. I had a crisis moment when Vanessa asked me to draw up this bit for her. You know, sometimes it’s just that connection you have with a photo and you can’t describe it? It’s magical, that’s what it is. But well, if we’re trying to put that attraction into words, then I would say what makes a photo appealing to me first and far most important is the lighting. I have an attention span too short to be spending time trying to search for the focus product within a bunch of shadows. The size of the photo is just as crucial, I mean, I’m already staring at tiny texts near 12 hours a day, I don’t need to spend more time squinting at the computer screen, trying to decipher what is in the photo composition. As for the whole white v. cluttered background debate, I’m not too fussed on that. Some people have the talent to strategically background their photos *cough* Vanessa *cough*, and then there are people that have wonderful photos with 90% of it as blank space. For me I love photos to be light and bright and big, that’s the main thing for me. I’m terrible for clicking off blogs if the photos aren't big and clear! I like a photo to be engaging too, not just one product in the middle of white space. I personally really enjoy playing with texture and props, and really filling the frame! A well executed photos has crisp lines, no blurriness and is properly lit. A photo should also be properly sized when presented on a blog. 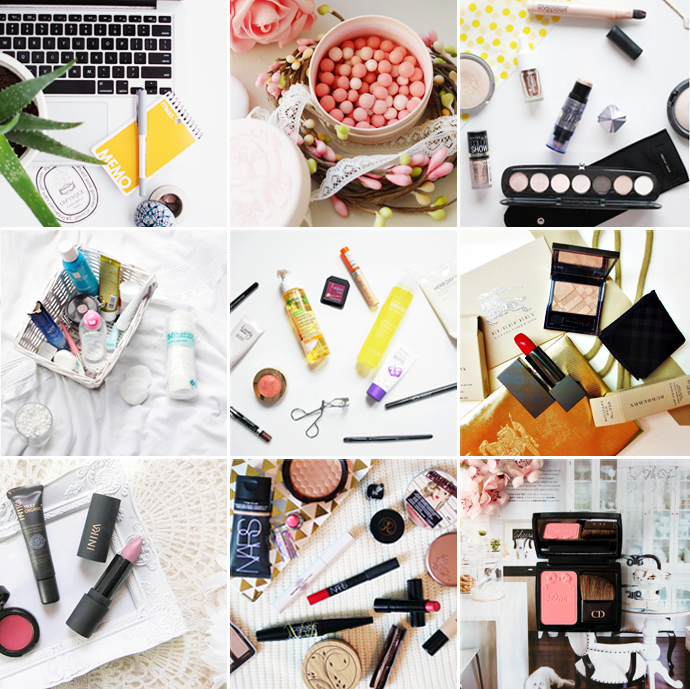 I don't like seeing blog photos which are much smaller than the width of the blog text or photos taken in the dark with only a desk lamp illuminating the products. Good lighting is one (though of course editing helps with that for most people) in addition to the pictures being sharp/focused and not grainy (which can occur for those that blog with their phones). It's interesting to see how different lighting can make pictures appear. Harsh light adds interest to pictures for me because of the sharp shadows they create (as seen on The Beauty Look Book). Also props help. Blank white backgrounds can be nice, but they tend to get boring after a while. I like when pictures have texture to them 'cause it makes them seem more 3D and adds more interest to them. Similarly, a messy background can add interest to photos, but sometimes I question the choices of people who didn't seem to put much thought into theirs. Strange backgrounds (like piles of paper for beauty posts) don't make for cute backgrounds and look sloppy/lazy to me. My fave parts of a photo is COMPOSITION and LIGHTING. For sure. it needs to look beautiful and artistic in the way the products are placed and not messy. AH IT'S AN ART. (and other important things that might be of use if you...y'know, read the whole post).